This item sold on March 29, 2019. Each pair of these tights is exclusive and unique, because all the designs are hand painted and one of a kind. Therefore the designs may vary from product to product. The colour is sustainable, but it is recommended to wash the tights with hands only. 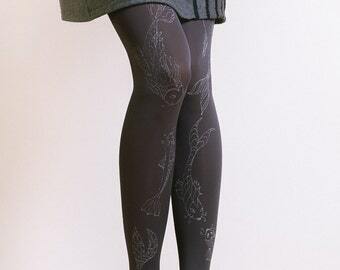 By browsing through the photos above you can see the pink version of the tights with this design, but it can also be made on different colors of tights or leggings. The tights and leggings used by Ami are mostly produced in France or Italy. The price varies depending on the thickness of the tight fabric and the complicity and size of the painted motives. These tights are meant for women who like to accent their legs in a beautiful manner and are looking for including unique pieces of clothing in their wardrobe. These will definitely make you stand out of the crowd. 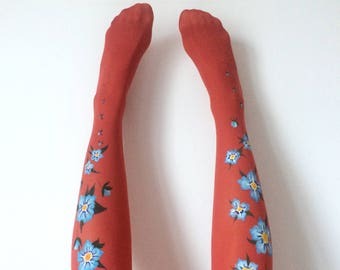 Unique tights for women with hand painted motives "Forget Me Not"
Unique tights for women with hand painted motives - Red wine, please! 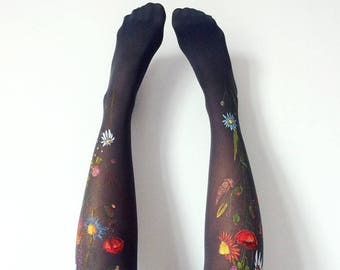 Unique tights for women with hand painted motives "Wild Thing"
Collant très beau et vendeuse très aimable ! This shop owner is very kind, even asked for any customizations to my order. Also shipped promptly when I requested- received within a week from Europe to US after post date! Super committed seller! Beautiful work as always. If you want a unique statement piece, you can't do better.